The Primera LX900 full color label printer is for printing quick, short and economical runs of labels up to eight inches wide. Use this printer when you desire vibrant color and extremely high image quality to distinguish your products. The LX900 is perfect for labeling food products, especially high-end, limited production items or new food lines subject to design change. The LX900 is Primera’s mid-line color label printer and features individual color ink cartridges so you replace only the colors that need replacing. 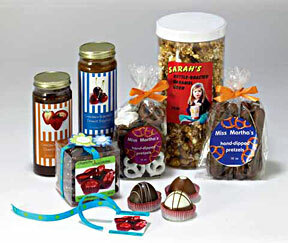 Labels can include photos, illustrations, logos, graphics, text, bar codes and nutrition panels. Labels stand up to heat, moisture and cold. Works with Windows or Macs. Use the included label design software or Photoshop®, Illustrator® or similar. Save time and money by printing your own labels! The Primera LX900 full color label printer is for printing quick, short and economical runs of labels up to eight inches wide. Use this printer when you desire vibrant color and extremely high image quality to distinguish your products. The LX900 is perfect for labeling food products, especially high-end, limited production items or new food lines subject to design change. Give your new food production business an edge by showing extremely professional, impressive samples, even if you only make a few at a time. Labels can include photos, illustrations, logos, graphics, text, bar codes and nutrition panels. Meant for all kinds of food products, the labels stand up to heat, moisture and cold. 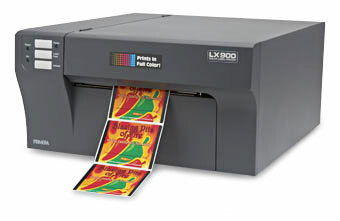 The LX900 is Primera’s mid-level color label printer (cost- and speed-wise). 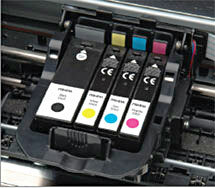 It features individual color ink cartridges so you replace only the colors that have run out. 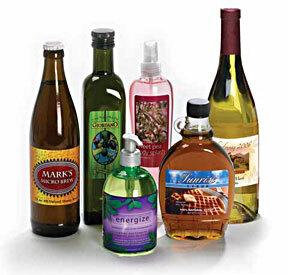 This can reduce label costs by 30% or more compared to single-cartidge systems when labels are distinctly toned. The LX900 also features more and faster production and draft modes for overall greater throughput. A Fast Workhorse Desktop Label Printer: With the LX900, you’ll produce full-color labels at up to 4.5” per second in draft mode. Short runs are printed fast and efficiently, helping you to increase the production of your products. You can even operate several LX900 printers from one PC as your production volumes grow. Whether you print just a few labels at a time or thousands, they’ll be printed at speeds you probably never thought were possible from a desktop label printer. The LX900 utilizes the latest in high-resolution inkjet technology to print brilliant full-color products labels on-demand. Connecting via USB, it works with Windows or Macs. Use the included label design software or Photoshop®, Illustrator® or similar. Professional-quality results: Don’t settle for low-resolution color labels on your products. LX900’s incredible 4800 dpi printing delivers results that far exceed virtually any other on-demand print method available. Six print resolution settings let you select combinations of print quality and speed to best fit your application. No matter which you choose, your labels are bright, colorful and professional. Many applications: The LX900 produces gorgeous, professional-quality labels for all your short-run, specialty products. It’s ideal for gourmet foods, wine and water bottles, personal care and natural products. It is also perfect for a host of other uses such as proofing before going to press on longer runs, test marketing, contract manufacturing, private label goods, promotional labels and much more! Get up and running quickly: From initial set-up to full operation, the LX900 is easy to use. Plus, everything you need to start printing labels is included in the box. Each LX900 ships with BarTender™ SE design software, sample roll of high-gloss labels, ink cartridge and USB cable. You’ll be printing full-color labels within minutes of taking the printer out of the box. Economical to Operate and Maintain: The LX900 has individual inks for cyan, magenta, yellow and black. This means you only need to replace the ink cartridge that has been depleted instead of the entire cartridge, saving money on every label you print. You’ll also be printing “greener” by not wasting ink if your designs use more of one color than another. The print head is designed to be semi-permanent. If a replacement is ever needed, simply snap it in and out of the printer – no tools required. Print labels when and where you need them, in quantities you can really use! Best of all, depending upon the quantity you print, the price per label will be significantly less than labels printed on flexo or offset. More than forty standard label types are available in both round and rectangular shapes, from about 1.5” square or round to 8” x 8”. Label print width can be as narrow as 0.75 inches and as wide as 8 inches. Though label widths may be 8 inches, the LX900 actually prints up 8.25" wide, so printing is to the edge of the label with no border (full-bleed). (The LX400 prints up to 4 inches wide.) The maximum label length is 17 inches. Custom label stock is available. Water-resistant labels! The LX900 prints onto many different label, tag and ticket materials, including inkjet coated high-gloss, semi-gloss and matte labels. Labels printed on high-gloss material are highly scratch- and smudge-resistant and virtually waterproof. This is a perfect solution for primary or box labels that can be exposed to water, rain and snow. Supply Roll: 6” maximum diameter on 3” core. Label Design Software: NiceLabel SE Primera Edition included. Can also be used with most other popular label design software.